I stood in the doorway of Mi Cafeto, looking around the jazz filled room. A staff member greeted me, I smiled, and like always, wherever I go, I was unsure of which table to choose. Hesitantly, I sat down at the closest one. At first, I was taken aback by the setting of the café, but on reflection this is only because I am so used to frequenting small cafes, holes in the wall, or tiny shells with standing room only. However, this place was more set up like a traditional café, with painted walls, beautiful art, Italian ceramic tiles on the walls and floor, and soft leather chairs. I was then given a menu to look over. Printed across a double page of paper were a dozen verities of coffee beans and their descriptions; some I’d never tried before. The menu was completely in Japanese, which made it hard for me to really know which coffee to select. I looked around wondering when my friend might arrive. The café was quiet, with only a couple of costomers. However this is not surprising for Tokyo at a few minutes after ten in the morning. I looked back down at the menu trying to understand it, but still unsure what to choose. My regular mid-morning beans are often Ethiopian, I like the tea-like body, and floral taste, but being here for the first time, I felt it would be a missed opportunity to not try something new. So I was determined to choose something different, it was just a matter of what that would be. The waitress approached me for the second time. I explained- not very well, that I was waiting for a friend, and that he shouldn’t be long. Then, just as I said that, he walked in. He is a semi-regular here, and as he sat down he began telling me about the place. First, he pointed out the temperature controlled coffee beans cellar on the far wall. I was surprised that I hadn’t noticed it earlier, but because it was behind slightly tinted glass, and from where we sat, it was difficult to work out what it was. He went on to explained that it is where they store green beans for regular private customers, and how he’d like to be one of them someday. Then when they are needed and ordered, they were roasted fresh, then delivered to their door. “In a PET bottle?” I asked. Next to us was a display of roasted beans for purchase, nicely packaged in plastic bottles. I thought this was unusual, but after realizing a sealed plastic pressure resistant bottle would lock in the aroma far better that anything else, and would also slow down the aging process of the beans, I guess it made sense. We then looked back at the extensive coffee menu, as the waitress returned to take our order. I still hadn’t made a decision on what I was going to drink, however my friend had decided on San Sebastián from Guatemala- one of his favorites here, so I ordered that too. 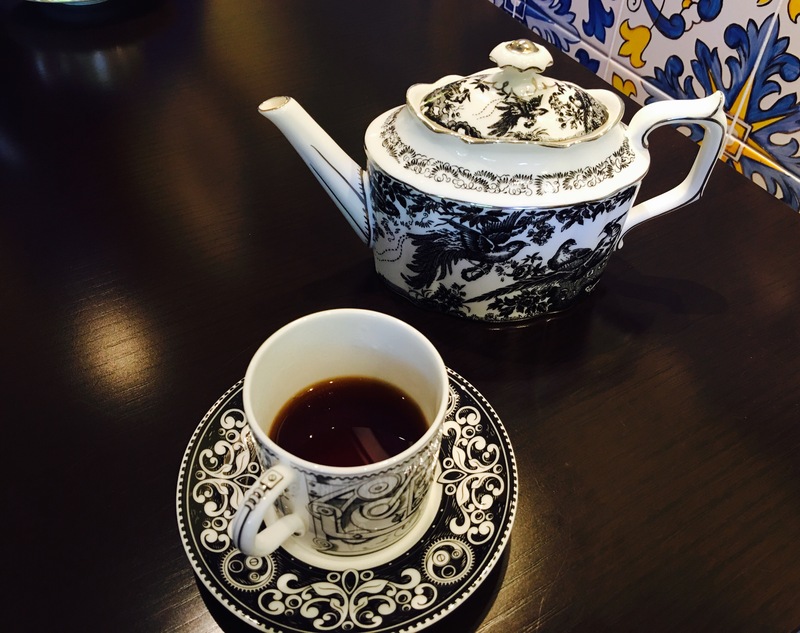 The coffee came served in a beautifully hand painted ornate ceramic coffee pot, with a matching miniature cup, slightly bigger than an espresso cup. It was mild, nutty, hints of honey, with a slight sourness to finish. Over the next hour, we quietly chatted over our small individual pots of coffee, in the soft comfortable chairs, inspired by the level of quality that surrounded us. The owner, Jose Kawashima has deeply thought of every detail in the design and experience of this cafe, even down to the choice of using a McIntosh sound system. I am counting the days until I next return to continue their coffee menu, and find a new favorite. My biggest concern when I first became a father, wasn’t if I’d be good at it or not, if I could provide for them, or anything about loving them enough. It was that I’d pass on my worst personality trait. It’s a trait that I still find confusing. I find it this way, not because I think I’m above it, but, because it’s misdirected. it’s the trait of worry. I worry too much about the inconsequential. I heard in the speech of my parents growing up. And unfortunately, I hear it in myself too. I usually try to to keep it at bay, however it was prominent on Saturday. It was the first weekend of March. A lovely warm day here in Tokyo. The plum blossoms are blooming, and the city is in anticipation for the main event in a few weeks, the cherry blossoms. If Spring is natures season for new beginnings, the cherry blossoms are the reminder to live bold and strong, as life can be fleeting. And it seems like my son has adapted some of those concepts too. Under the external staircase of our house sits a child’s bike. It has a coat of dust covering its once shiny gold paint. Its strong steel frame, heavy suspension forks, and big thick black tires could hold the weight of any father. However, it has sat unused for close to two years. It was gifted to my son from a family friend, but was too heavy for him to control at the time. Then on Saturday morning out of nowhere, he decided he wanted to start riding it around the neighborhood. This was surprising. Like i said, he never rode the bike, and I’d contemplated giving it away. However, once he got on the bike, he didn’t want to stop. First he rode laps around the block, then he rode along side me as I walked down to the local 7-11. Then after that, he rode it to the library. During these trips, I was doing what all parents do in this situation, telling him to stop at every crossway, to watch out for cars and people, don’t go too fast down the hill, and anything else I could critic him on. It frustrated him to the point that he stopped and put his fingers in his ears. At that point, I knew I was being an over barring over protective parent. My son knows the safety he must take when crossing a street. He knows how dangerous a main road can be, hell, I’ve told him enough times, along with his mother, his grandmother, his grandfather, and they probably drum it in at kindergarten too. Therefore, on the walk back I bit my tongue. Later that afternoon, I rode around the neighborhood with him, leading by example. And on one of his short breaks from riding, I gave the bike a clean, checked the tires, and adjusted the seat to the perfect height. Some of my greatest memories when I was he’s age were experienced on a bicycle, and I long for him to have the same. I may not be able to completely let go of worry from my life and my children’s, but this weekend was a small step in the right direction.